Though Vancouver is the bustling, giant, metropolis of British Columbia, the actual capital of the westernmost province is Victoria. It’s a picture-postcard city, with some amazing architecture, and a decidedly English feel. You’ll find quaint tea shops, awesome seafood, trendy London chef’s, and boutique bohemia alongside a growing entrepreneurial and technology base in the beautiful Vancouver Island city. In fact, the influx of technology companies, driven from Vancouver by high property prices, is giving the capital a new nickname “Tectoria”. 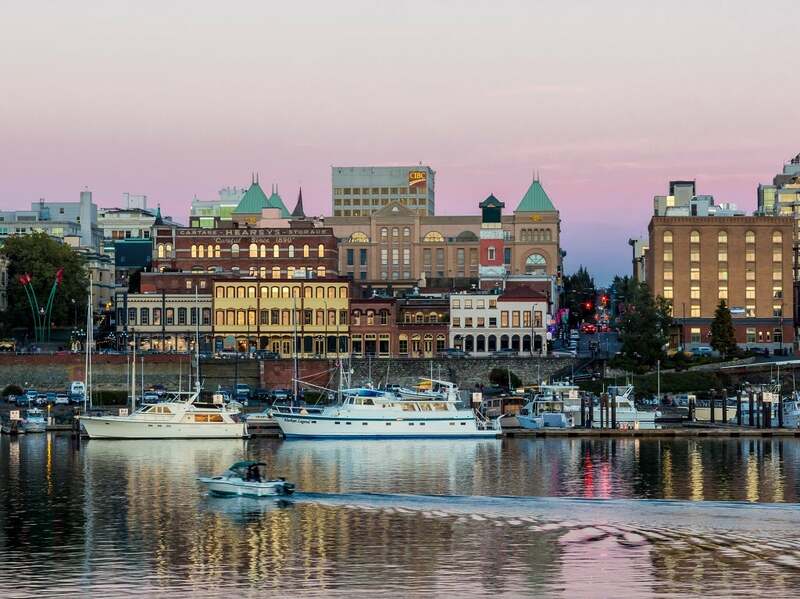 Victoria sits on the southern tip of Vancouver Island, on the west coast of British Columbia, Canada, it’s roughly 100 kilometres from Vancouver or Seattle across land and the Strait of Juan de Fuca. You can either take a short flight or one of the regular ferries across the ocean. Known as the “Garden City”, home to historic buildings from the late 19th and very early 20th centuries. Sitting on lowlands nestled amongst stunning Canadian mountains and now home to a thriving technology sector which generates one of the largest streams of revenue for the city, alongside tourism. Victoria itself has a population of 85,792, with 383,360 living in the surrounding area of Greater Victoria. It’s the 15th most populous Canadian metropolitan area and the 7th most densely populated city of Canada. The Victoria area was originally home to the Coast Salish people and the Songhees. The northwest coast of British Columbia was explored widely by the British and Spanish in the 18th century. James Douglas founded Fort Victoria in 1841 on the site of present day Victoria. In the gold rush to the British Columbia mainland in 1858, Victoria became the port and supply base for miners on their way to the Fraser Canyon gold fields. The population of Victoria grew from 300 to over 5000 in a few days. It became a city in 1862. Esquimalt in Greater Victoria became the North Pacific home of the Royal Navy in 1862 and remains Canada’s Pacific coast naval base. When the Canadian Pacific Railway terminal was completed on the Burrard Inlet in 1886, Vancouver took over as the commercial centre of British Columbia. The Victorian era saw the construction of Craigdarroch Castle and other grand residences, and the opening of Butchart Gardens in 1904. Victoria’s genteel English feel was born and has remained. A real estate boom just before the first world war saw the construction of many Edwardian buildings which also contribute to Victoria’s character. English is the principal spoken language in Victoria. It’s less multicultural than many cities with just 10% also speaking French, and ethnic minorities at less than 20% of the total population in the census of 2011. However, the statistics don’t make Victoria unwelcoming, any visitor or new resident will find the same open and gentle Canadian nature in the city as with anywhere else in the country. Victoria is surrounded by ocean on three sides, the area itself is rolling lowlands surrounded by granite peaks of around 300 meters tall. The shoreline, formed by glacial activity, mixes cliffs and lagoons with pebbled and sandy beaches. Looking south from Victoria is a stunning view of the Olympic Mountain range in Washington State, USA. Greater Victoria covers an area of 695 square kilometres, it has 48 regional, provincial and federal packs of more than 22,724 acres. The area is renowned for its mild climate, walking, hiking, fishing and incredible wildlife. Whale watching tours in the Strait of Georgia are a not to be missed tourist, or new visitor activity. The island is the largest off the west coast of North America and sits close to the mainland cost of British Columbia, and the north shore of Washington State’s Olympic Peninsula. The US is actually closer than Canada! It has a spine of mountains which run the length of the island intersected by the Alberni Inlet which juts more than halfway into the island. The Victoria area has its own fjord inlet – The Saanich Inlet. Victoria is located in a sub-Mediterranean zone and boast the mildest climate and driest summers for Canada. It’s frost free for eight months and the annual average 2,200 hours of sunshine makes for a popular tourism destination, and a retirement location for Canadians and non-Canadians alike. It’s true that Victoria has a historically older population with it’s warm, coastal location and relaxing city life but that’s also now being complimented by the tech savvy migrants leaving Vancouver’s clouds and smog for the thriving nearby city. The climate in Victoria is much tamer than many Canadian locations, winters are mild and rainy, summers dry and sunny. Temperatures tend to sit between zero and 30C across the year and although there is snow in the mountains and on other parts of the island, Victoria tends to be snow free. Vancouver Island, including Victoria, is a high-risk area for earthquakes. The last large quake occurred in 1946, of 7.3 magnitude and killing two people. It’s well published that the island is overdue for a big quake and emergency preparedness is essential for the region. The island is also at risk of a subsequent Tsunami. Though the siting of Victoria means it’s less at risk from a Tsunami than other locations, the local government advocate Tsunami readiness. Analysts predict a magnitude 9 quake would cause a water level rise of 3.5 metres travelling at 1 metre per second. A tsunami warning, or a quake lasting more than 60 seconds, signifies residents to immediately move to higher ground once any quake has passed. You can also consider immigration routes through the Provincial Nomination Program for British Columbia, in order to move to Victoria. For some schemes you will need to meet the criteria for one of the federal programs too, and the process of applying may overlap. Again, a points based system, if you have a high net worth and wish to invest in, and manage a valid business it may apply to you. If you are working for a company looking to expand into the British Columbia or Vancouver Island area this will open up a further route to immigration for you. It’s not just Victoria and Vancouver that are seeing an influx of technology companies and entrepreneurship. The sector as a whole is vital to the growth of British Columbia. The provincial government recognises this and is keen to assist the immigration of technology professionals to the province. They have recently introduced the BC PNP Tech Pilot which may speed up, and increase the chances of, permanent residency in Victoria, or for British Columbia. Though there are some direct flights to Victoria from the USA, the chances are you will need to change over in Seattle or Vancouver. Flights from Seattle take around 45 mins, and from Vancouver around 30 mins. Or, take your main flight into either airport, then choose the ferry over to the island for a more scenic route. You may even see a whale on the way! Unless you’re planning to join a cruise ship to head in Victoria, from the USA you probably want to fly, or fly and then catch the ferry. Cruise ships stop at Esquimalt, Greater Victoria on their way to Alaska. You can of course choose to drive to Victoria, taking your vehicle and picking up the car ferry at either Vancouver or Seattle. There are also a number of Amtrak rail routes into Vancouver. From the USA to Victoria you will need to move your belongings by land, and then ferry from Vancouver to Victoria. You either choose to do this yourself or hire a shipping or removal specialist. Remember that you need to pack your belongings, including any furniture and breakables for a long road journey and a ferry trip. You’ll probably need to hire a vehicle, book your ferry passage ahead of time for a large vehicle and make sure you have a driver. You can ship your belongings ahead of time so they are waiting for you when you arrive. If you are going to be waiting for the rest of your items when you arrive in Victoria, it’s important to pack what you will need immediately, and to pack appropriately for you how you will be travelling. Unemployment in the Victoria area is the lowest in Canada. British Columbia has the lowest unemployment of all the Canadian provinces. This doesn’t mean there no jobs available. Victoria, as a growing base for technology companies looking to escape the high prices of Vancouver, but still stay close, has plenty of opportunities. Construction too is seeing a high demand for skilled labour with $1 billion worth of building permits issued for 2017. Tourism and a high average population age means that food and beverage, and accommodation venues are in search of staff. Canadian schools have high academic standards and Victoria is renowned for its educational facilities. It was rated Canada’s Smartest City by McLeans and a Top Student Destination. Every child in Canada has a legal right to education and there are no tuition costs for Grades 1-12. Excellent private schools are also available. There are a number of private, international and language schools in Victoria and the Greater Victoria area, including a girl’s school. Ranked 14th by QS in Canada, the University of Victoria is a large public research university and has around 21,000 students. It’s one of the most international in Canada. Previously the Royal Roads Military College it became a university in 1995 and focuses on applied and professional degrees. Monthly rent in a normal Victoria area for around 900 square foot will set you back $1,288 CAD with around $187 CAD in utilities for two people. A beer will cost around £2.87 CAD, 12 eggs $3.89 CAD and a meal for one in a fast food restaurant $9 CAD. Generally, rent and utilities are reasonable but groceries can run a little more expensive with the costs of importing to the island. The road network across Vancouver Island is excellent. For Victoria too but what might come as a surprise are winding, bendy roads instead of the typical grid system. Blame the English heritage for that! Victoria is home to iconic double decker buses, much like those you would expect to see in London. There is an extensive bus network with bus and bike priority lanes across the city. There is a BC Ferries Connector coach service between Victoria and Vancouver or Vancouver airport which includes the ferry fare. It takes around 4 hours to complete the journey via coach which includes an hour and a half for the ferry crossing. There are also bus services across the island. There is currently no rail service on Vancouver Island. Last services ceased in 2011 due to the track being unusable. Victoria International Airport serves cities across Western Canada. There are non-stop flights to Toronto, San Francisco and Seattle. Helicopter and seaplane flights are available daily from Victoria’s Inner Harbour to Vancouver International Airport, Vancouver Harbour and Seattle. Victoria has the world’s largest seaplane airline – Harbour Air, who operate scheduled and scenic flights around the region. There are several ferry routes between Victoria and the mainland of British Columbia, the Gulf Islands and the US. There are mix of passenger and passenger and car services available. You are able to drive in Victoria for 90 days with your US driving license, after which you must exchange it for a Canadian driving license. You can do this by taking your documentation to a Service Canada location where you can complete the process quickly and be provided with a photographic driving license. Victoria is a beautiful ocean side location with incredible European architecture, manicured green spaces and is nestled amongst a still wild green, mountainous island. If you’re moving to Victoria you won’t struggle to find an attractive neighbourhood to locate to. Oaklands is close to downtown, with excellent access to schools and shopping, but still affordable so perfect for families. Rocklands is an upmarket location home to Government House, and with the best views of the mountains and oceans. It’s a mix of mansions and apartments and certainly a more expensive area. Downtown is vibrant and trendy, with the second oldest Chinatown in North America. Victoria West is just across the Victoria Harbour and a mix of residential, commercial and industrial properties. Many affordable developments are appearing on the waterfront in this growing neighbourhood. Victoria is a popular tourist destination, for its architecture and history, island location, whale watching tours, hiking and all-round quaintness. It also has the highest opera attendance per capital of any Canadian city and is full of art galleries. There are regular performances from theatre to ballet and music. During summer there are many buskers and street performers, artists and carvers. On government street there are usually bands, from African marimba to jazz, fiddle and bluegrass. As well as less scheduled musical performances Victoria hosts a number of major music festivals in June and July including the TD International Jazz Festival, Vancouver Island Blues Bash, the Victoria Ska Festival, and Rock the Shores. Other events include the Victoria Highland Games and Celtic Festival, Parksville Lion’s International Kite Festival, Gabriola Theatre Festival, and the Victoria Dragon Boat Festival. The 1994 Commonwealth Games were held in Victoria, as was the 2007 FIFA U-20 World Cup. The 2010 Winter Olympics were just across the water in Vancouver. Victoria will co-host the 2019 World Junior Ice Hockey Championships. Rugby Canada and Rowing Canada are based out of Victoria, which also has high profile hockey and football teams. Victoria has a history of motorsports and has the oldest speedway in Western Canada.